Posted April 20, 2016 & filed under Things to do in Dewey Beach DE. As the weather gets warmer and the end of the school year draws near, your family probably can’t wait for their summer vacation to begin. And while you may be content lounging on the sand with a good book, your kids will probably look for something a little bit more adventurous to do. Here at Atlantic View Hotel, we recommend taking them parasailing with Dewey Beach Parasail. An exciting and fun activity for family members of all ages to participate in, you can join your kids in the air or relax on the boat or beach while they experience Dewey Beach from an exhilarating vantage point. Children age six and older are welcome to participate, lifting off into the air from a custom built parasail boat. Delaware’s largest and most experienced parasail operator, Dewey Beach Parasail is located at the Rusty Rudder in Dewey Beach, as well as in the Indian River Marina. With 12 years of experience, Dewey Beach Parasail has coast guard inspected boats and a perfect safety record. Reservations are recommended, so call 877-FLY-DEWEY to set up your adventure! 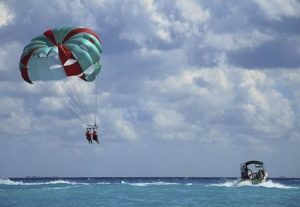 Parasails fly from May to September. Book your summer vacation to Atlantic View Hotel for a memorable and fun getaway your whole family will love! Located on the oceanfront, there is no better view to wake up to every morning of your Dewey Beach vacation. We can’t wait to see you here!